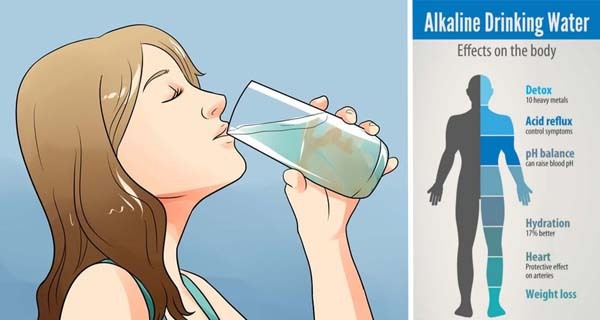 How To Make Alkaline Water In Order To Fight Fatigue, Digestive Issues And Cancer? In order for it to be healthy and able to prevent diseases, our body should be a little bit alkaline. However, many factors, like the environmental, processed foods, chemicals and stress, influence our body state and make it more acidic (if not highly acidic). This is a serious issue as it leads to more health complications, including fatigue, digestive issues and weight gain. Moreover, if not balanced on time, this environment in our bodies may influence healthy cells and they will become toxic, and over time, even cancerous. The pH scale goes from 0(the most acidic) to 14 (14 the most alkaline). 7 is therefore neutral, and our bodies are designed to thrive in a slightly alkaline environment of 7.4. However, our body organs function on different pH levels. For instance, the pH of the digestive tract can vary a lot, from 1.5-7.0, and is influenced by many factors, but mostly by the diet we consume. Our saliva is more acidic in order to be able to help the digestion of food, and its pH ranges from 6.5-7.0, as it). On the other hand, the typical pH value of the skin is 5. Also, according to the findings of a 2006 study published in the International Journal of Cosmetic Science, its pH should be 4-4.5 in order it to be more strong in eliminating and preventing infections. Namely, the science has discovered it long ago, and we are all aware that the food we consume can significantly determine our overall pH levels, and in that way, our health condition. Since 1931, when Dr. Otto Warburg found the truth that has made him win the Nobel Prize in Psychology or Medicine, researchers constantly struggle to determine the ph value of different foods, and their contribution to the environment of the body. Dr. Otto Warburg’s discovery revealed that 90-95% of all types of cancer occur as a result of an acidic environment. Moreover, he found that cancer cells simply cannot survive in an alkaline environment, when the pH is around 7.36. As he stated a century ago, there is a relation not only between acidosis (over-acidity) and the formation of cancer, but with almost every chronic disease nowadays, such as heart disease, diabetes and osteoporosis. As soon as your pH level drops, your body’s mechanisms try to regulate itself naturally (to create homeostasis) by holding and storing some excessively acidic substances in your organs, including your liver, lungs and kidneys. Thus, it can keep up an optimal pH of between 7.35-7.45. However, these acidic substances will eventually start to strike the healthy cells, causing them to be toxic, damaged and sick. Over time, if this issue is not solved, these cells can grow without control and spread to other body parts or organs, that is, that is, they will metastasize. As we previously mentioned, one of the major causes of the chronic acidosis is the modern diet, which is rich in sugar, caffeine, highly- processed food and alcohol. These foods are also grown with the use of numerous additives, pesticides and growth hormones, which are additionally acidic. Therefore, it is absolutely logical to make numerous changes in the diet in order to preserve the health of your body. Moreover, you can also benefit a lot from a detox made by consuming alkaline water. The human body is 70% water, so a proper alkaline water will lead to homeostasis. 1 large glass jar (plastic has chemicals and impurities that are acidic to your body). Pour the water in the glass. Cut the lemon in slices and add it inside the water. Add the Himalayan salt. Cover the glass and leave it at room temperature for 12-24 hours. For best results, consume the alkaline water the first thing in the morning, before you start your day or eat anything. Drink 3 glasses of the alkaline water on an empty stomach. You can also consume it during the day. The effects are inevitable! Over some time, you will start feeling different, full of energy1 Furthermore, your skin will be clear and radiant, and you will have more concentration and your brain will be more alert. If you combine the alkaline water with a healthy diet (free of sugar, additives, toxins and processed food), regular exercise and if you avoid stress, you will soon become a completely new person!